The Pentek RO-2550 reverse osmosis system is tested & certified by NSF International against NSF/ANSI Standard 58 for the reduction of Barium, Cadmium, Chromium (Hexavalent and Trivalent), Copper, Cysts, Fluoride, Lead, Radium 226/228, Selenium, Turbidity, & Total Dissolved Solids (TDS). Great value in a brand-name, performance-validated RO system! Reverse osmosis, also known as nano or ultra-filtration, is the finest home water treatment system available, capable or removing particles as small as 1/1000 of a micron. 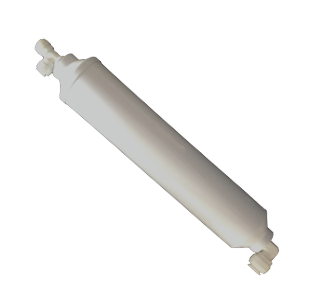 The Pentek RO-2550 is manufactured by U.S. based Pentair Water, the largest manufacturer of water treatment products in the world. It has been third-party tested and certified by NSF International against NSF/ANSI Standard 58 for the reduction of Barium, Cadmium, Chromium (Hexavalent and Trivalent), Copper, Cysts, Fluoride, Lead, Radium 226/228, Selenium, Turbidity, and Total Dissolved Solids (TDS). Like most reverse osmosis systems, it can also be expected to significantly reduce a wide range of other contaminants as well. The Pentek RO-2550 reverse osmosis system offers high quality drinking water at a fraction of the cost of bottled water and without the hassle of re-filling bottles. Bottled-water quality drinking water will be right at your fingertips anytime you need it, for drinking, cooking, and more. Its compact size makes it a great choice for use in homes, cottages, recreational properties, and even RVs! The RO-2440 can be easily connected to your fridge ice-maker and water dispenser. high performance sediment & carbon pre and post-filters including 10 micron carbon block pre-filter! features automatic shut-off valve when tank is full - doesn't waste water unnecessarily! 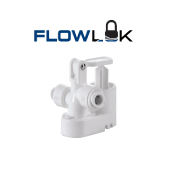 The FLOWLOK Leak Detector is an innovative device that installs right below your water filtration system in minutes. No special tools are required and it does not need electricity to operate. FLOWLOK Leak Detectors utilize a highly compressed safety disc that expands when it absorbs water. Once the safety disc has detected water it expands and trips the FLOWLOK safety lever to shut off the water entering the water filtration device. Safety discs are replaceable and are economical. - traps silt/dust, rust and sand that affect the taste and appearance of your water - it also protects the other filters from premature fouling. - reduces chlorine (and chlorine bi-products), bad tastes, odors, and more. - enhances clarity and taste of your water to ensure the ultimate level of quality is attained. Output / Production: Testing by NSF International according to NSF/ANSI Standard 58 yielded 15.04 gallons per day with source water test parameters of 50 PSI pressure input, water temperature of 77F, pH of 7.5 +/- 0.5, and 750 ppm total dissolved solids (TDS). Higher production rates are expected with lower TDS levels. Lower production rates can be expected at colder incoming water temperatures. Self-Cleaning: The RO-2550 system uses a process of crossflow to constantly clean the membrane to prevent pre-mature fouling and clogging. 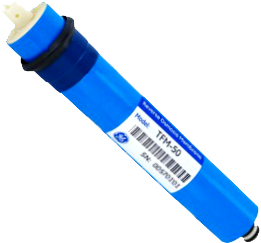 For more information of the removal/reduction of various contaminants by carbon filtration and reverse osmosis, please CLICK HERE. This system is designed for use on all chlorinated and non-chlorinated potable water supplies. It is an excellent choice for most homes. If you do not receive your water from a municipal water system (you get your water from a well, lake or other non-treated source), you should have your water tested to ensure it is biologically safe (free of bacteria, viruses, and other harmful microorganisms) before using a reverse osmosis filter as your only water treatment. If your water is biologically contaminated, you should consider a point-of-use or whole-house ultraviolet purifier in addition to your reverse osmosis unit to kill any remaining microorganisms. The filtration unit and storage tank mount under your sink, out of sight. Water supply is gained by attaching a simple adapter to your cold water supply pipe (copper or plastic). You will have to drill a hole in your countertop or sink frame to attach the attractive long-reach faucet. It is a relatively easy do-it-yourself project, or if you prefer, you can have it installed by a handyman or plumber. The unit includes all installation hardware and a complete installation guide. 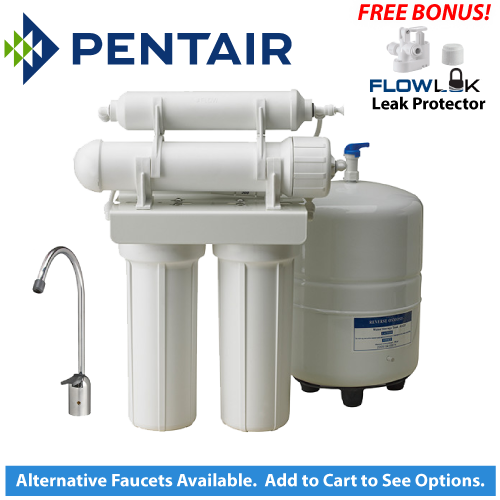 Pentair Residential Filtration warrants to the original owner (under normal use) to be free from defects in material and/or workmanship for one (1) year from the date of purchase. Note: this product is not available in the State of California. CLICK HERE for more information. Note: The contaminants or other substances removed or reduced by this water treatment device are not necessarily present in your water.